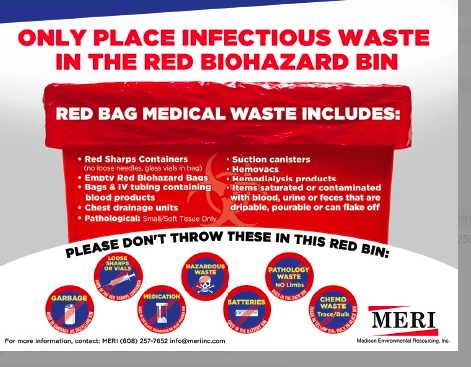 MERI is offering a FREE Infectious Waste Poster to help hospital employees determine what medical waste goes inside the red biohazard bin. Part of the confusion around infectious waste is that is goes by many names, including: biohazard, red bag, RMW or regulated medical waste. While state regulatory information may vary, according to the Wisconsin DNR’s website, the following waste is considered infectious, and should always be segregated from standard waste. ● Sharps ­- Unused or disinfected sharps that are being discarded, such as hypodermic needles, syringes with needles, scalpel blades, lancets, broken glass or rigid plastic vials and laboratory slides. PLEASE NOTE: all sharps must go into a rigid container before going in the biohazard bag. ● Bulk blood or body fluids – Pourable or drip able amounts of blood or body fluids or items saturated with blood or body fluids. ● Microbiological laboratory waste – Cultures derived from clinical specimens and discarded laboratory equipment that has contacted cultures. ● Human tissue – Teeth but not hair or nails. NOTE: teeth with amalgam fillings should go into a hazardous waste container. ● Animal tissue, bulk blood or body fluids – From an animal carrying a zoonotic infectious agent such as rabies, anthrax or tuberculosis. One of the ways to quickly make staff aware of what should go in the red bin is to hang this free poster near your biohazard containers. For safety’s sake, we’d like to reiterate that there should be NO LOOSE SHARPS in either the biohazard bag or medical waste bin. All sharps should go into a separate sharps container. This sharps containers should go inside the biohazard bag. Or, if using a reusable sharps container, go on the reusable sharps cart. Medical waste transporters may also carry out larger rigid sharps biohazard containers. Knowing what goes in an infectious waste bin — and what doesn’t — is the key to a medical waste generator savings. Thousands of dollars get wasted each year simply because items get inadvertently thrown into a red biohazard bag rather than another appropriate container. For example, standard trash items, such as paper, bottles and food, should never be disposed with your infectious waste. These items are like infectious waste fat, adding poundage with no benefit. It costs a lot more, pound per pound, for infectious waste disposal compared with general waste. The easiest way to reduce the amount of infectious waste an organization produces has little to do with its actual waste production. Rather, it’s making sure your entire staff understands the difference between infectious waste and general waste. Hopefully, this poster will help with that effort! If you have any further questions, please email us or give us a call at (608) 257-7652.